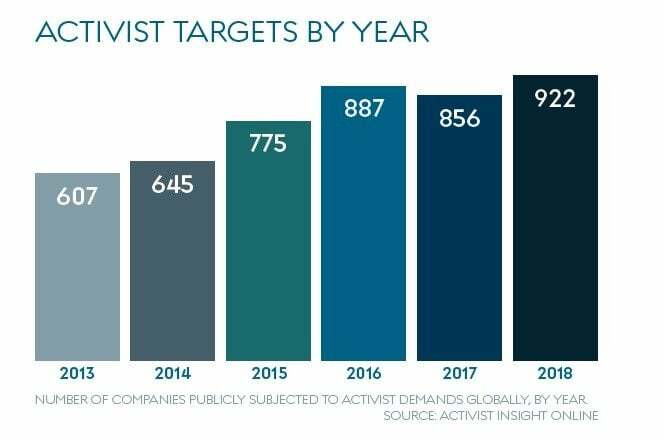 With the launch in 2018 of Activist Insight Governance, a new database of bylaws and directors; a major update to Activist Insight Vulnerability that allows for company-to-company comparisons; global stock price tracking; and a major retagging of board representation and M&A demands on Activist Insight Online, 2019 promises to be an exciting one for subscribers to Activist Insight. The pages of this review highlight the depth of information on offer: from the more than 800 activist directors currently serving on U.S. boards to the number of bylaw amendments each year at Russell 3000 companies; the 922 companies targeted worldwide in 2018 to the 207 settlements involving board seat changes; the “bump” obtained by activists opposing deals; and the many successful predictions of Activist Insight Vulnerability. While we expect to share some of these insights across our platforms, including more in-depth articles in Activist Insight Monthly and Activist Insight Online, only by taking all five can users fully benefit from everything on offer. A brief glance at activism in 2018 shows that, after a brief dip in 2017, things are back on track. 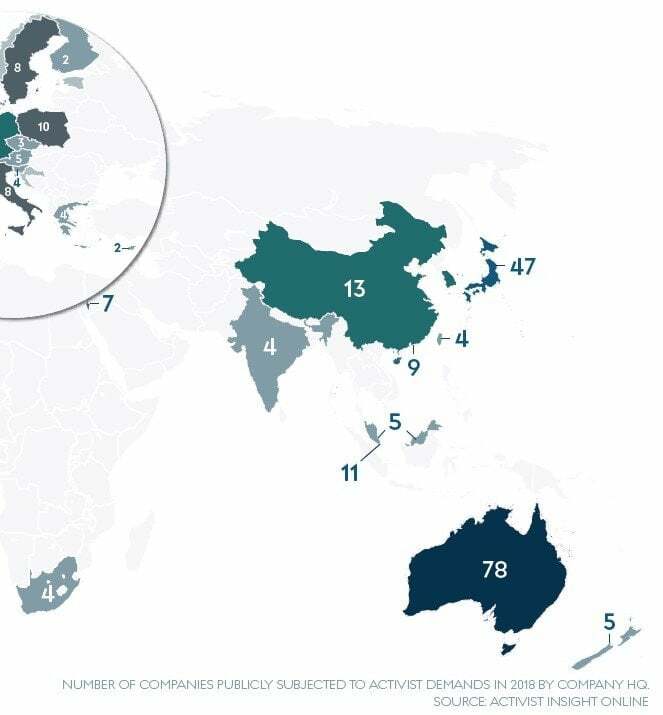 The number of companies publicly targeted hit record highs in the U.S., Canada, Japan, Australia, and the U.K. Non-U.S. targets made up a record haul of 47%, passing 400 for the first time. Prior to the end-of-year volatility, high valuations in U.S. markets and disruptive forces elsewhere clearly had an impact – as well as swelling activity in Australian and Canadian basic materials industries, only 53% of companies targeted in the Brexit-hit U.K. were targeted by homegrown activists. M&A activism flourished in a deal-friendly environment: bumpitrage and Elliott Management’s take-privates captured the most attention even as the lines between financial and environmental, social, and governance (ESG) activism continued to blur. Activists piling on top of each other at companies like Newell Brands, ThyssenKrupp, Whitbread, and United Technologies highlighted both a limited pool of ideas for well-capitalized funds, and the benefits of incremental pressure as each moved slowly but inexorably in the directions demanded of them. 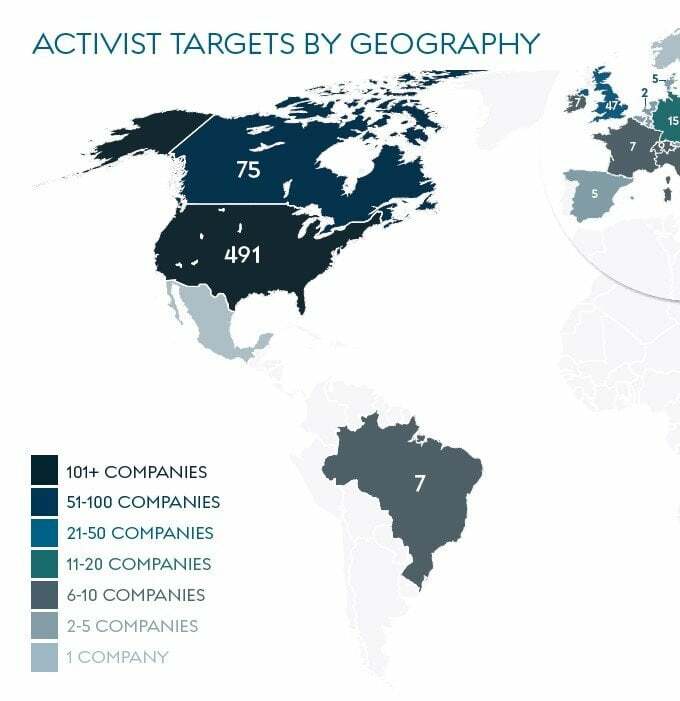 Those tactics meant activists could be effective with smaller pools of capital: according to Activist Insight Online, only $42 billion was invested in new positions in the U.S. and Europe during 2018, compared to $72 billion the previous year, even as the proportion of targeted companies valued at more than $10 billion increased. Activists did not lack for ambition. As we point out in the pages overleaf, they targeted companies with high insider ownership or with no obvious buyer – or both, in the case of Campbell Soup. Trian Partners began a campaign at PPG by calling for the ousting of its CEO, perhaps for the first time. Yet a year without many big proxy contests meant fewer tests of how institutional investors view activists. Still, activists will have to address the concerns of major shareholders if they are to get a hearing from management teams. As Proxy Insight shows in an article for this report, fears of robo-voting are wide of the mark. Although there has been some talk of engagement-fatigue over the past year, both index funds and active managers are looking deeper into companies for potential risks, with human capital management rising almost to the top of the agenda alongside board diversity. For their support of this report, I am grateful to Georgeson, Innisfree M&A, D.F. King Canada, Alvarez & Marsal, Finsbury, Moelis & Co, and to Schulte Roth & Zabel. It has been a pleasure to put together this report and I hope that our readers find it as enlightening. Activist Insight predicts household name activists will again struggle to find cause to fight proxy contests, although some campaigns that get stuck on a CEO change or other fundamental disagreement may go the distance. 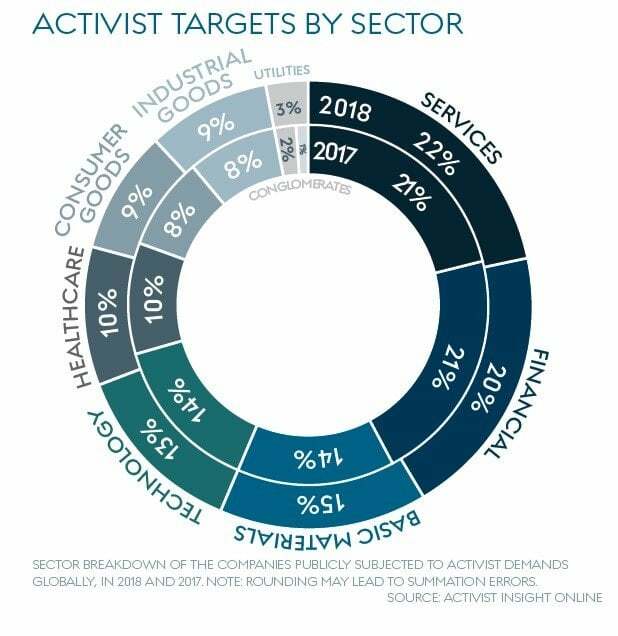 Although we were wrong about the need for a correction to drive activist activity to record highs, the markets will have an impact on whether the action in 2019 is in the U.S., or overseas. American activists have been studying markets like the U.K., Germany, and Japan for some time and an uptick in activity suggests they are now ready to deploy capital if valuations in the U.S. return to their previous highs. If American markets suffer another rout, however, activists will likely stay home. ESG did prove to be a consistent theme in 2018, if at a low rumble rather than a continuous roar. That will be the case again in 2019 with some funds racing ahead and others trying to keep up. Expect specialists to be in demand at both activist funds and advisory shops. Activists may push for transactions at an even more furious pace as credit markets tighten and the outlook begins to darken. Some advisers expect activity to mirror 2008, when overall deal volume fell but hostile takeover attempts boomed. Companies that already have activists on their boards may be especially vulnerable. reform wears off. Expect that to mean CEO tenures and multiyear earnings targets come under scrutiny, with more pressure for transformational changes along the lines seen in 2017. 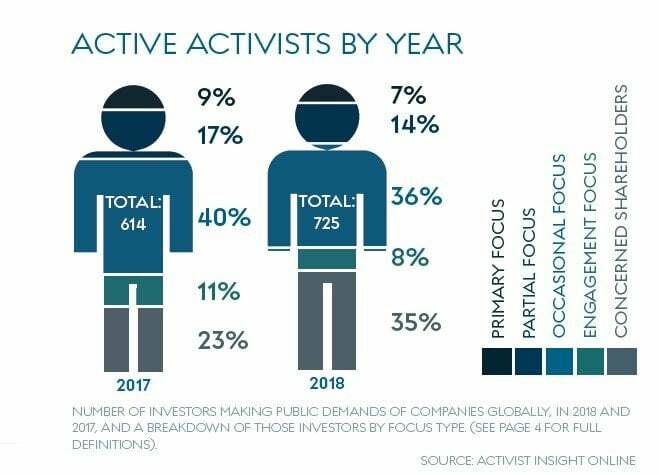 Private equity’s relationship with activism has been an uneasy one for a long time. Some private equity firms, such as Waterton Global Resources, are testing out activist strategies and others are partnering with Elliott Management to acquire companies. Yet others are queasy about being seen as unfriendly to management. “White squire” deals at Avon Products and Hudson’s Bay Company are alternative models, though they may not be successful. Whether private equity firms stay on the fence or start deploying dry powder in 2019 may influence strategies across the industry. Withhold campaigns played an outsized role in 2018, especially for newbie activists that had less experience of advance notice bylaws. Those bylaws may come under greater scrutiny following a 2018 lawsuit at Xerox, setting up another litigious proxy season. Whether Due To Lack Of Targets Or Sheer Nerve, Activist Investors Challenged Companies With Powerful Defenses Such As High Insider Ownership And Dual-Class Stock In 2018. The Trend Was Particularly Visible In The U.S., Where Instances Of Controlled Public Companies Are Rarer. Activists in Europe and Asia have long had to contend with strong and powerful insiders – with mixed results. In 2018, the trend crossed the Atlantic. Activists may have also been emboldened by the growing hostile sentiment toward poor corporate governance and unequal voting rights. Index creator MSCI mulled banning dual-class stocks from its indexes but watered down its proposal by creating new benchmarks that include voting rights in its eligibility criteria. The likes of index providers BlackRock and State Street generally oppose dual-class structures and staggered boards, with the latter falling rapidly out of fashion. The index providers’ growing clout puts pressure on companies to improve their corporate governance and creates openings for activists in situations they may deem egregious. According to Activist Insight Governance, 39 Russell 3000 companies removed classified boards in 2018, up from 24 in 2017. Controlled companies, defined by Activist Insight Governance as firms with more than 50% of voting power controlled by one entity, typically have poorer corporate governance practices than the rest. Only 2% of Russell 3000 controlled firms allow proxy access, versus 21% for Russell 3000 non-controlled companies. Fewer controlled companies have staggered boards than the average, but such a provision may not be needed when half of the voting stock is controlled by management. As a result, minority shareholders complain they do not have many avenues to hold managements of controlled companies accountable. Indeed, activists may need to employ more astute strategies to achieve their goals. In its campaign at Viacom in 2016, SpringOwl Asset Management targeted the executive leadership with a 99-page presentation. Eventually a rift between the company’s top brass and controlling shareholder Shari Redstone drove out the poor performers. Targeting a controlled entity may also require increased focus, and more resources need to be deployed. “When you have more difficult targets, the activists just need to run a more persuasive and better campaign to convince the management or the board or ultimately other investors that their idea for change is the correct one,” Frankl said. Wholesale changes at these companies is difficult to implement. Third Point Partners was forced to reduce its slate from 12 members to a minority of five at Campbell Soup before settling for three board seats, while Land and Buildings was successful in gaining one seat at Taubman in its second consecutive proxy contest. 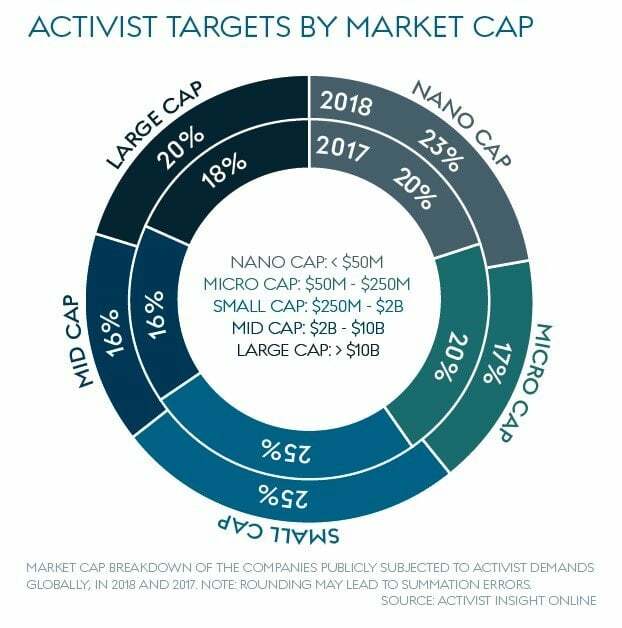 Whether activists continue to go after difficult targets depends in no small part on alternatives available in other parts of the market. A correction in stocks could reveal new opportunities. For now, some companies remain de facto out of reach. Their number is dwindling.